He held the post of "master of the king's games of bears, bulls and dogs". 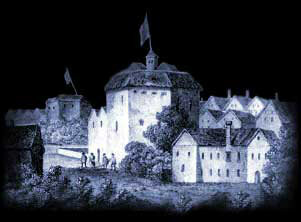 Edward Alleyn returned to the stage in an attempt to lure the crowds from The Globe Theatre. It is interesting to note that Dulwich College is an independent, fee-paying public school in Dulwich, a suburb of south-east London, England. Edward Alleyn founded the college to educate 12 poor scholars. Dulwich College now has 1450 boys and is the largest British public school. The names of the roads and streets around the college are named after Edward Alleyn and his family, for example Woodward Road was named after his first wife Joan Woodward. The Admiral's Men Acting Troupe, of which Edward Alleyn was the leader, were known as Lord Howard's Men after their patron Charles Howard, 1st Earl of Nottingham, 2nd Baron Howard of Effingham. In 1585, when Lord Howard became England's Lord High Admiral, the company changed its name to the Admiral's Men. The main rivals of the Admiral's Men were the Chamberlain's Men ( later the King's Men ) led by the Burbage family and William Shakespeare. Interesting Facts and information about the History, Life & Times of the famous Elizabethan actor, Edward Alleyn. Additional details, facts and information about the Globe Theatre and other actors can be accessed via the Globe Theatre Sitemap.